Note to guests: this is a 5-person game, and if you are not one of the five, please don't kibbitz. If you want to follow the excitement, it's here. New board per move and position, additional boards where variations are required. Never remove a label from a diagram; if you need to, make a new diagram instead. Always add to the end of the conversation about the current move. Don't edit or add comments in the middle. This will make the conversation easy to follow for observers without needing major edits (which, I predict, none of us will actually want to do). You mean never remove a diagram from a label? *Shrug* I suppose both rules are good. I agree: append, don't insert. But not too much deleting during the editing. daniel the smith: I meant if there's an a on the diagram, don't take it off because some comment probably refers to it. But yes. JoazBanbeck I showed every reasonable reply that I can think of. My favorite is 'e'. daniel the smith I think: a is out (white answers at c). I don't like e or f, because we might want to play g later for an emergency eye on the side. 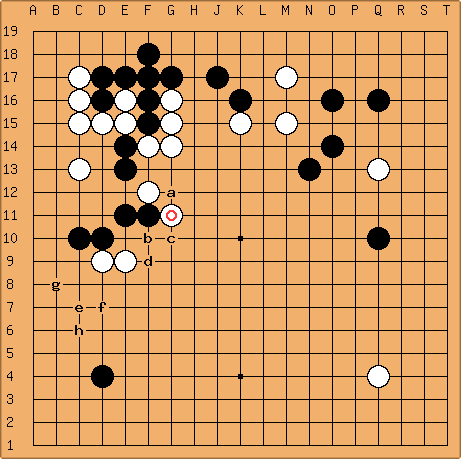 I'd prefer g to e or f, but I think most important is to keep white from getting a center dominating ponnuki/wall/et cetera, if at all possible. I think I prefer b directly. I added some diagrams. Dusk Eagle It's hard for me to know whether e or f are good moves or not. I can see their merits, but I have a fear Magicwand will somehow capture our group if we play them. Right now, I'm thinking 0.5 for e, 0.5 for b.
JoazBanbeckWe are going to have to fight our way out - probably with 'b' ( 3 in this diagram ). Let's make him heavy first. Then we can attack him while running. Diagram 42.E.2 White makes the most dangerous tenuki that he can. JoazBanbeck What does 'd' look like if the marked stones have been exchanged first? daniel the smith I think white just descends to B 9 and then we're screwed. JoazBanbeck I think you're right. Ok, that puts 'd' out of the running, IMHO. daniel the smith Clearly this isn't good atm. Joaz BanbeckMove 'h' also works despite white's most vigorous attempts to cut. Joaz Banbeck Guys, I'd like to clarify the voting process. I thought that everyone had 24 hours to get an opinion in. But the last three moves have apparently been made with only 4 people, and if my clock is correct, they have been made in less than 24 hours. Daniel didn't get to vote on move 12. I didn't get to vote on move 14/16. Nor did I get to vote on move 18. Ok, I'll grant you that 12 was a no brainer and that 14/16 was forced. But I still object in principle. On move 18, not only do I object in principle, but I sincerely believe that you guys chose an inferior move. daniel the smith Agree, there should be 24 hours for everyone to check in.